Farmers markets and farm coops, such as CSAs, are delicious antidotes to industrial fake food products. 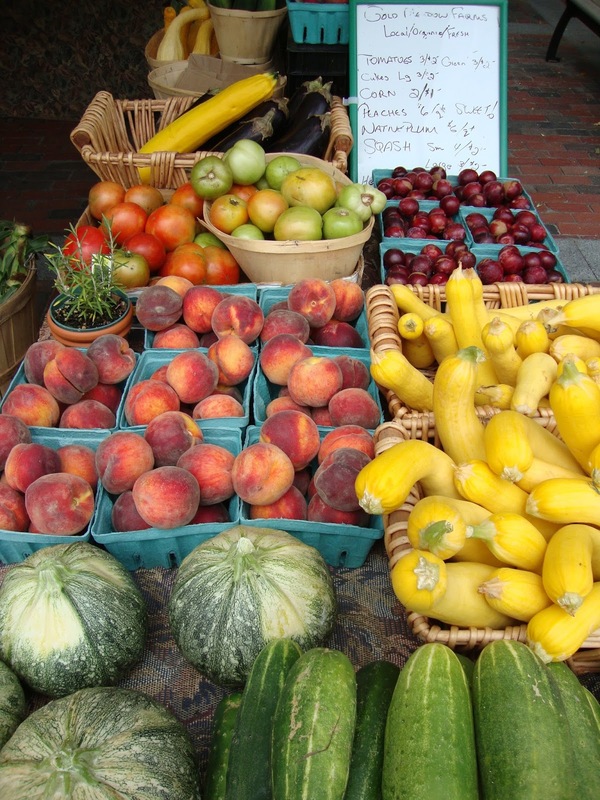 August is the gloriously perfect month to enjoy... or begin to enjoy... fresh produce. Farmers' markets are open across the country in mid-summer, and bursting with freshest goodness... with melons, corn, tomatoes, zucchini and summer squash, peaches and nectarines, bell peppers, blueberries and strawberries, eggplant, and much more, depending on the U.S. region. This week, my CSA carton will include a watermelon, two varieties of peaches, two lbs of tomatoes, cherry tomatoes, baby broccoli, a bunch of basil, potatoes, bell peppers, and a unique red romaine lettuce. (All for $38!) All was grown, harvested, and distributed by small family farms in Central California. To locate a farmers market, call or check the website of your local city government or Chamber of Commerce. Or search here using the USDA's comprehensive "Farmers Markets Search" database. To find a CSA that serves your community, search here at Local Harvest's database. At Local Harvest's website, you can also learn about the workings of CSAs, and about the advantages for both farmers and consumers. One more reason I urge everyone to shop farmers markets and CSAs: freedom. Freedom from the unhealthy industrial fake foods that dominate supermarkets. Freedom from supporting major industrial corporations rather than local entrepreneurs. Freedom from the federal government's funding agenda (via the farm bill) of genetically-modified foods teeming with chemicals, additives, fillers, and artificial flavors and colors... fake foods manufactured by political donors. Besides being sunny fun, think of shopping farmers markets and CSAs as striking a blow for American freedom of choice.